Stuffed Zucchini with Tuna. I went to the farmers market in Union Square and found these nice round zucchini, the last one of the season. They are perfect to be stuffed and baked. I decided to bake them stuffed with tuna preserved under oil. Slice the top of the zucchini, and empty the zucchini using a tea spoon. 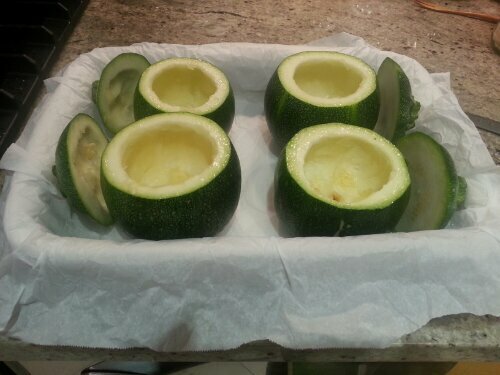 Finely chop the zucchini pulp. Finely chop the 2 Roma tomatoes. 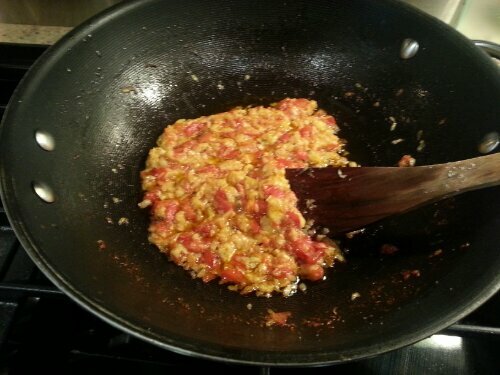 In a pan heat olive oil, and add the finely chopped garlic and the hot pepper slice. 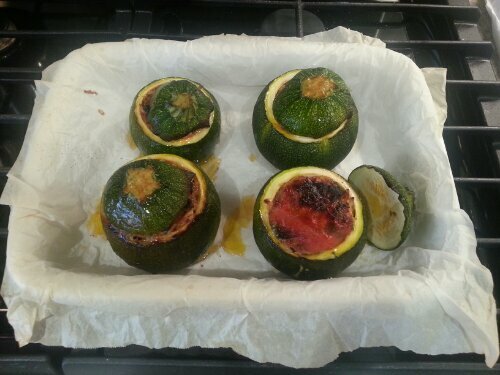 Then add the zucchini pulp and let it cook down a bit. Add the tomatoes, 1 anchovy cut in small pieces, some thyme, and salt. Let cook for several minutes until most of the moisture is evaporated and you obtain a thick sauce. Let it cool down. To prepare the stuffing: in a bowl mix the bread soaked in white wine, the tuna, the zucchini sauce, and the parsley. If the mixture results too liquid you can add some bread crumbs, I didn’t need to. Put some salt and olive oil in the zucchini. Stuff the zucchini, and if you like top them with a couple of teaspoons of tomato sauce. Bake in the oven preheated to 180 C (or 370 F) for 50 minutes or until ready. I bake them “opened” and then put the top on, as a decoration, when they are ready.